South Lake Tahoe hugs the southern shore of Lake Tahoe. A national treasure, the majestic lake and mountains showcase the raw beauty of nature and are the jumping off point of countless outdoor activities. 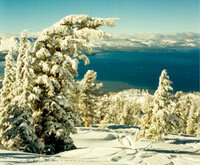 Fun can be had anytime of year by snow skiing, boating, hiking, biking or exploring the area's endless trails. Located 60 miles east of Placerville and 25 miles south of Reno.